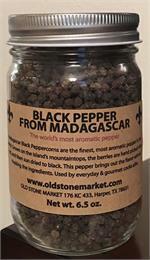 Madagascar Black Peppercorns are the finest, most aromatic in the world. Grown on the mountaintops of this Island, the berries are hand picked when red and then sun dried to black. Beloved by French chefs the world over, this pepper has the ability to bring out the flavor of whatever you are cooking without masking the intrinsic ingredients. Customers who have purchased this pepper from us in the past have sent us glowing testimonials. “Even my kids won’t us anything else!” says one satisfied California client. If you like pepper, we absolutely guarantee your delight and satisfaction. 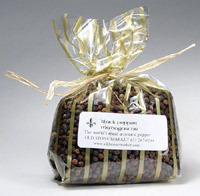 Attention restaurants ~ wholesale peppercorn purchases available. Please contact us for more details.